Abstract Painting is an oil and gouache painting on a medium-sized canvas by the British artist Vanessa Bell. It comprises six blocks of colour on a yellow ground. Four of the blocks – vertically oriented rectangles in maroon, green, blue and grey-blue – are presented overlapping from the top to bottom left of the canvas, while a small red rectangle hovers in the mid-section and a lone pink square resides at the top right. There are no inscriptions to indicate the orientation of the work, but the direction of the brushstrokes and the slightly thicker paint layer towards the end of the rectilinear forms has been used to decide on this present orientation. There is evidence of pencil underdrawing on the canvas, which is wax-resin lined and remains unvarnished. Made in London in around 1914, this work is one of only four fully non-representational paintings within Bell’s oeuvre. They show the artist experimenting with abstraction and investigating through her practice theories of significant form propounded by her husband, the art critic Clive Bell, and her close friend and former partner, the painter and critic Roger Fry (see Clive Bell, Art, London 1914). The work represents a critical pivot in Bell’s career, when she was balancing theory against practice, form against signification, aesthetics against representation. The abstract geometrical forms in this work are reminiscent of the mosaic-like representation of the domestic environment and the mottled effect of colour in earlier works such as Frederick and Jessie Etchells Painting 1912 (Tate T01277) and The Bedroom, Gordon Square 1912 (Art Gallery of South Australia, Adelaide). Aside from three other known surviving fully abstract works, only Bell’s textile designs also eschew representative forms. Portraits produced later in the 1910s also contain blocks of abstract colour reminiscent of those in Abstract Painting, for example Helen Dudley c.1915 (Tate T01123), Iris Tree 1915 (Tate L02306) and Mrs St John Hutchinson 1915 (Tate T01768). In subsequent still lifes and interiors framing blocks of colour are also present, but often with slightly more representational detail, showing Bell’s experimentation with methods of transcribing everyday objects into painterly form. Examples include the drapery found in Chrysanthemums 1920 (Tate N03836), Interior with a Table 1921 (Tate N05078) and Pheasants 1931 (Tate N05749). Bell did not remain satisfied with pure abstraction for long. In 1989 Quentin Bell recalled challenging his Mother over her move away from abstraction as a younger man: ‘Why, I asked Vanessa, did you give it up?’. He recorded that ‘roughly speaking her answer was because, having done it, there seemed nothing else to do ... and then one discovered that one was, after all, in love with nature’. (Quentin Bell, Bad Art, London 1989, p.119.) Simon Watney, one of a few art historians who has attempted to deal with Bell’s abstract work, notes that ‘with hindsight her entire career bears down relentlessly on this point of technical and conceptual sophistication’ (Watney, 1980, p.100). However, rather than suggesting that Bell’s abstraction was the apex of her development as an artist, he argues that the grace of the formal relations – the elements of proportion and spatial design – in her later work, as well as her craft practice, was shaped by these forays into pure abstraction. Simon Watney, English Post-Impressionism, London 1980, p.100. Richard Shone, The Art of Bloomsbury: Roger Fry, Vanessa Bell and Duncan Grant, exhibition catalogue, Tate Gallery, London 2000, p.160, reproduced no.83. Christopher Reed, Bloomsbury Rooms: Modernism, Subculture, and Domesticity, New Haven and London 2004, p.152, reproduced no.108. Bell was one of the first British artists to experiment with abstraction. In the early 1910s her approach to painting was radicalised by a series of exhibitions curated by her friend Roger Fry, in which works by Cézanne, Gauguin, Picasso and Matisse were seen in London for the first time. Responding to such examples, her compositions became more simplified, her use of colour more vibrant. 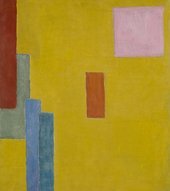 During this period she also made a small number of wholly abstract paintings like this one, characterised by blocks of bold colour. Lit: Richard Morphet, introduction to catalogue of exhibition Vanessa Bell: Paintings and Drawings, Anthony d'Offay, November–December 1973; Richard Cork, Vorticism and Abstract Art in the First Machine Age, I, Origins and Development, London 1975, p.276, repr. (before removal of later addition to painting); Richard Shone, Bloomsbury Portraits, Oxford 1976, p.142, repr. Duncan Grant told the compiler (conversation 28 May 1976) that in about 1914 and 1915 he and Vanessa Bell each executed ‘a small number, not many’ of abstract works, among which was T01935 by Vanessa Bell. Grant did not remember who was the first of the two of them to paint an abstract work. Two other abstract paintings on canvas by Bell are known, one (38×27 1/2 in) somewhat damaged, belonging to the artist's daughter Mrs Angelica Garnett, has rectilinear elements, diagonal lines, a circle and circular elements; the other, an unfinished work on the back of a portrait also by Bell, was seen at Charleston by a member of the Tate Gallery staff on 30 September 1969. Two abstract collages by Bell, both with rectilinear elements are reproduced by Richard Shone (op.cit pp.146 and 147). There are no inscriptions on the back of ‘Abstract Painting’ to indicate which is the top, bottom, or sides of the work. However, the direction of the brush strokes indicates the vertical when the painting was executed. Furthermore the slightly thicker paint layer at the ends of the rectilinear areas suggests which was the lower side of the canvas when executed. These findings were confirmed by Duncan Grant. After the artist's death a white spot (shown in two reproduction loc.cit.) was added to the painting, when it is not known. This was removed after acquisition by the Gallery.